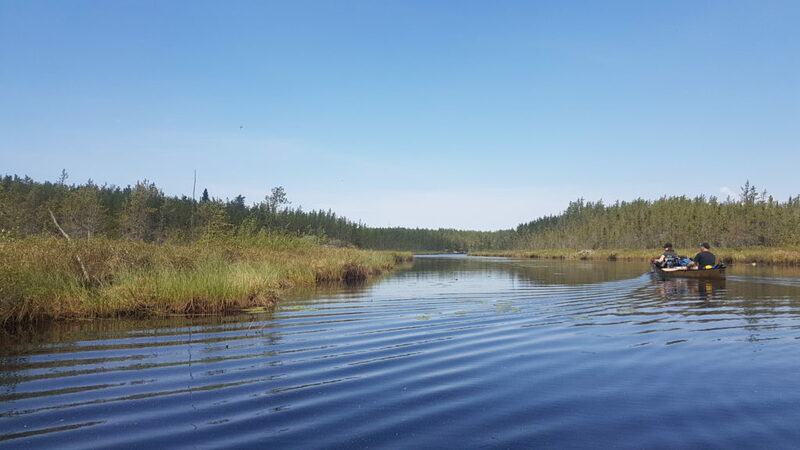 May was a busy month, involving things like my first trail ride with the new ATV, a trip for Lake Trout in Ontario, and culminating in a 4 day canoe trip up the Rabbit River and deep into the heart of the backwoods. 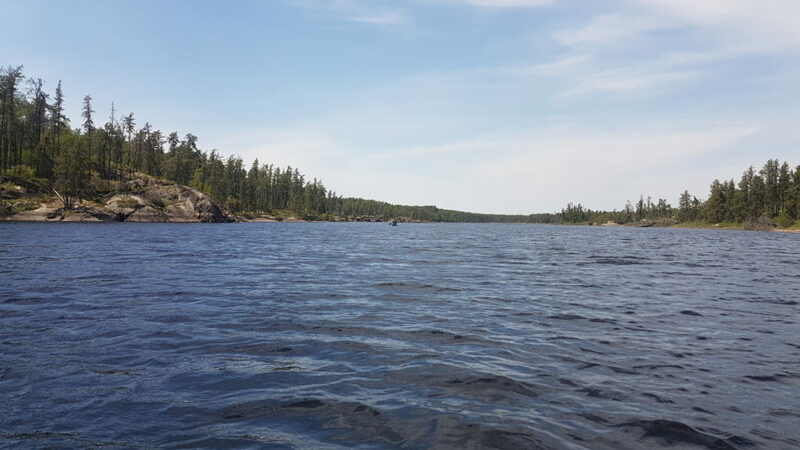 Our destination was Cole Lake, a smallish body of water in Nopiming Provincial Park. 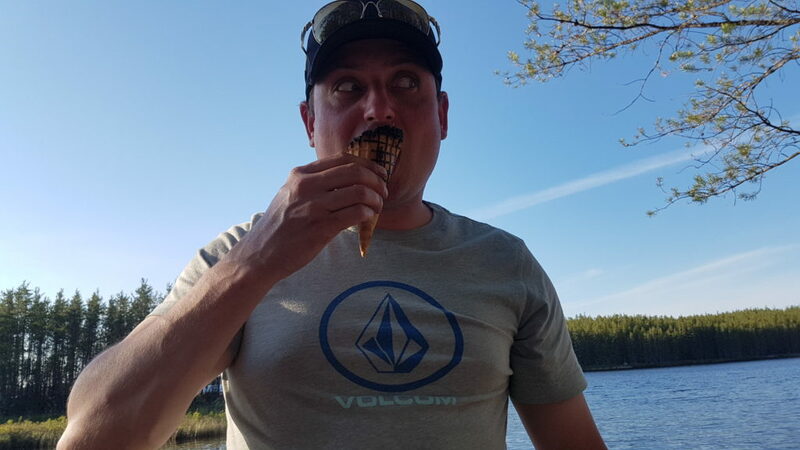 To get there we would need to drive for 2 hours, launch on the Rabbit River system, and then paddle and portage our way for 15km up the river. It was something we were all very much looking forward to, and we had been planning it for a couple months. Everyone met up at my place early Tuesday morning and we drove in from there. It was a windy, grey, miserable looking sort of day that promised rain. 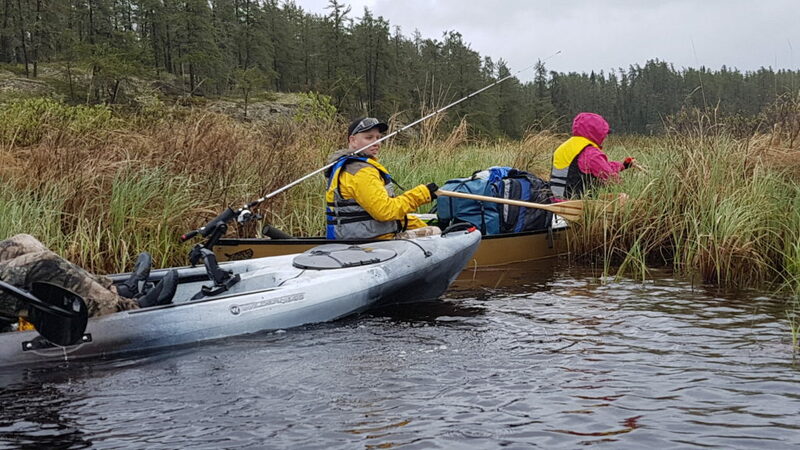 We had already pushed the trip back a day to avoid a rainstorm on Monday and were not looking forward to getting wet as soon as we launched, however we all had rain gear and high spirits as we parked the trucks and unloaded everything. It was drizzly and cold for most of the day, but not so much that it made the trip overly unpleasant. 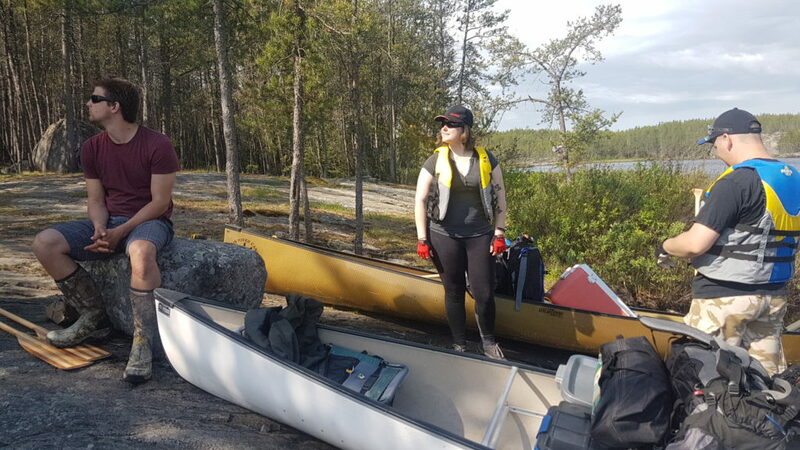 The water was low and paddling was hard work for the first couple km, in many spots we had to get out and just walk the riverbed, dragging our boats behind us on mere inches of water. 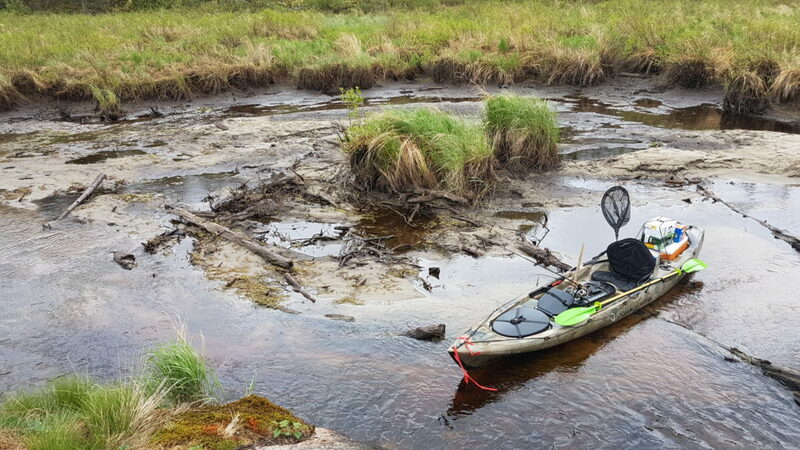 When we could sit in them and float, our paddles were pushing more mud than anything, but eventually we approached the first portage. 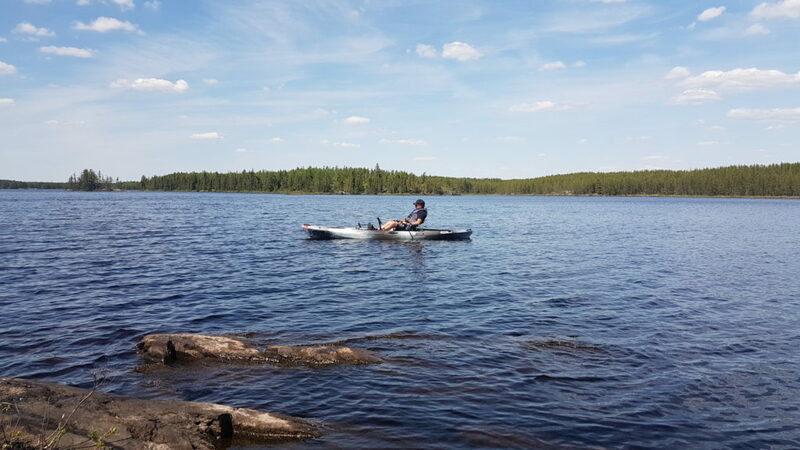 With the water so low, we had to walk the boats for the last half km or so before getting to the actual portage. The portage itself was a set of cool looking rocky rapids. 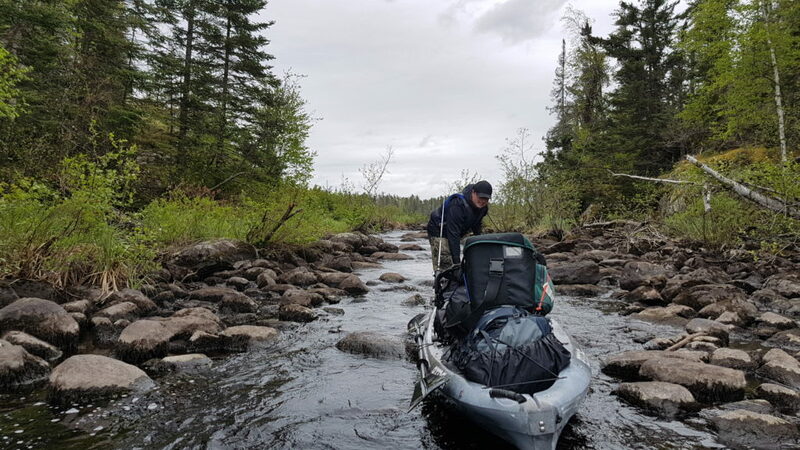 There was a path leading around them through the bush, and while the canoes stopped and unloaded and started carrying gear down the path, Les and myself decided we could drag the kayaks over the rapids instead. 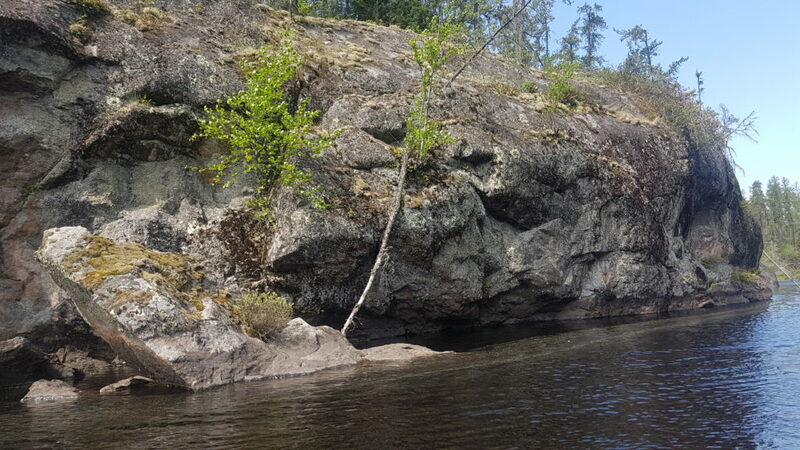 It worked pretty well, since the kayaks are so much lighter than the canoes, we just had to be careful on the rocks, and help each other across in some spots. 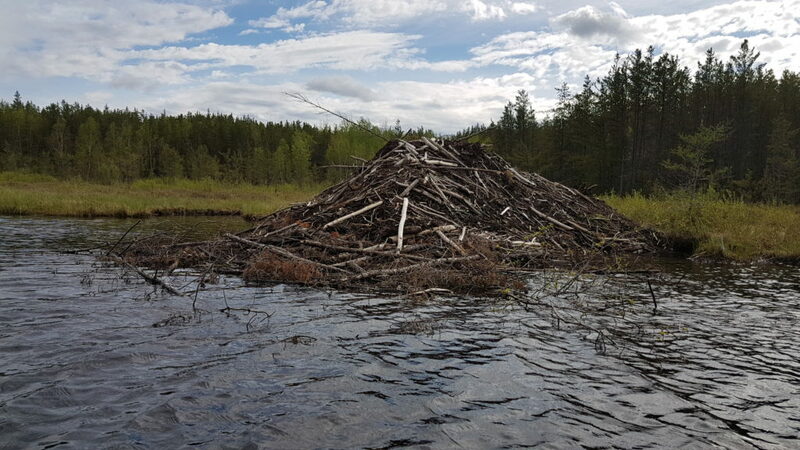 The water on the other side of the first portage was much deeper, likely due to the beaver dam at the top of the rapids. We were finally able to paddle for real without worrying about hitting bottom. While there was a few more spots along the way that we needed to walk the boats, they were thankfully few and far between. A few more portages like the first, with very scenic rocky rapids and paths around them through the bush. 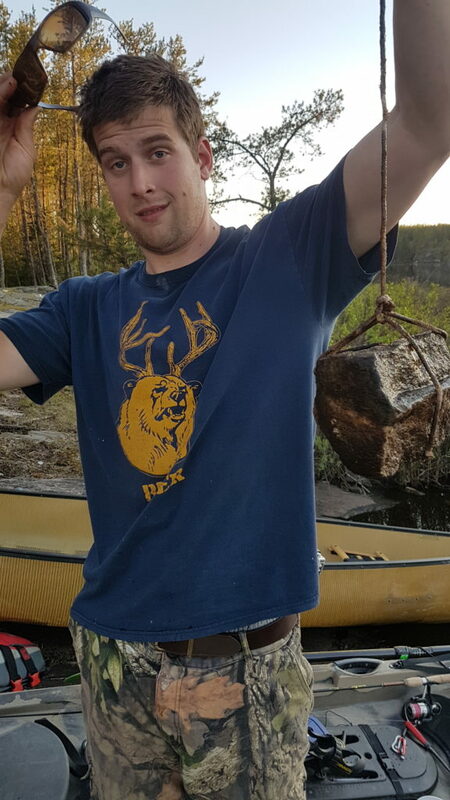 Some of these I dragged my kayak through the rocks, and some I went around. Either way they were all a good challenge and we had a good time getting past them. 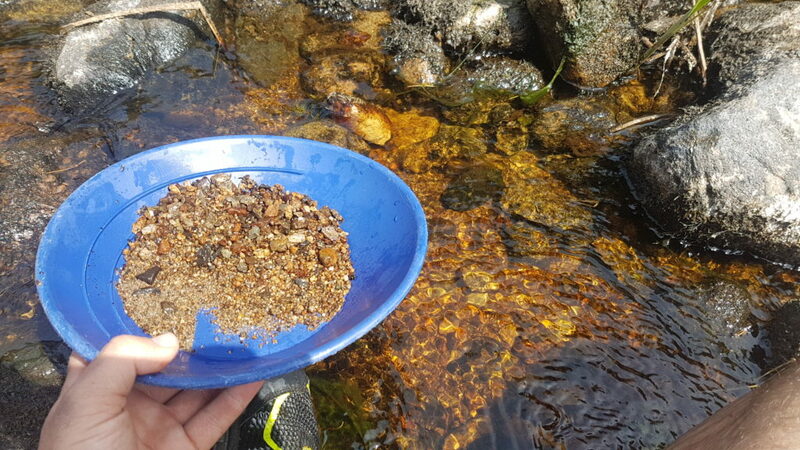 While we were near one of the rapids I brought out my little gold pan and started sifting through the gravel below the rocks while I waited for the others to get across. It wasn’t long before I turned up a good amount of small little specks and even a couple good sized flakes. 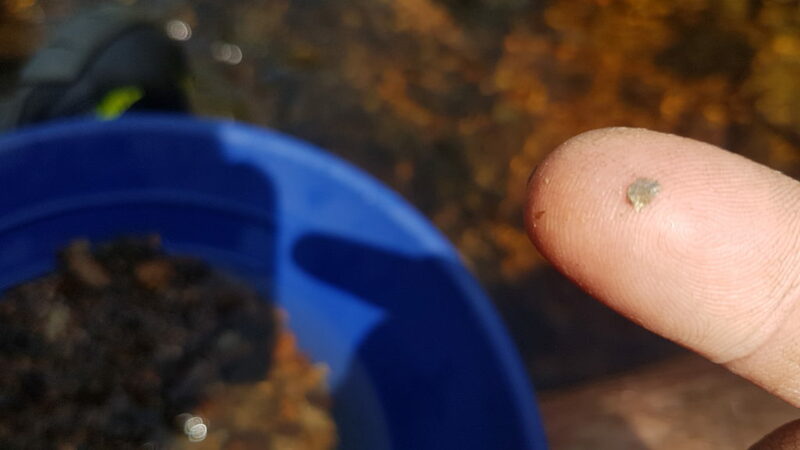 Panning for gold is a fun little hobby I picked up a few summers ago, and I’ve actually been quite successful at it. I picked up a cheap plastic pan on amazon and tend to take it out with me anytime I go camping, hiking, or into a new lake system. Don’t get me wrong, I’m not pulling out anything of real worth, I really don’t keep much of anything since I usually forget to bring something to put it in, but I still find it a lot of fun just to find it in the first place. 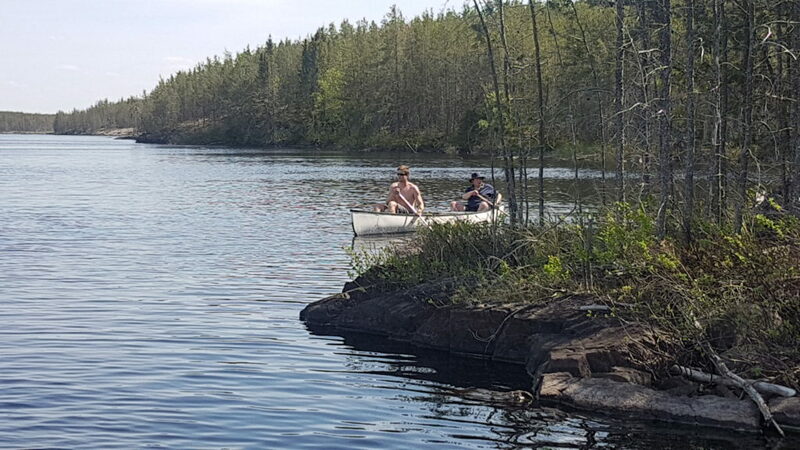 We carried on past the rest of the portages and finally made it into Cole lake where we would be staying. We found the campsite where we had decided to set up and took a look around. 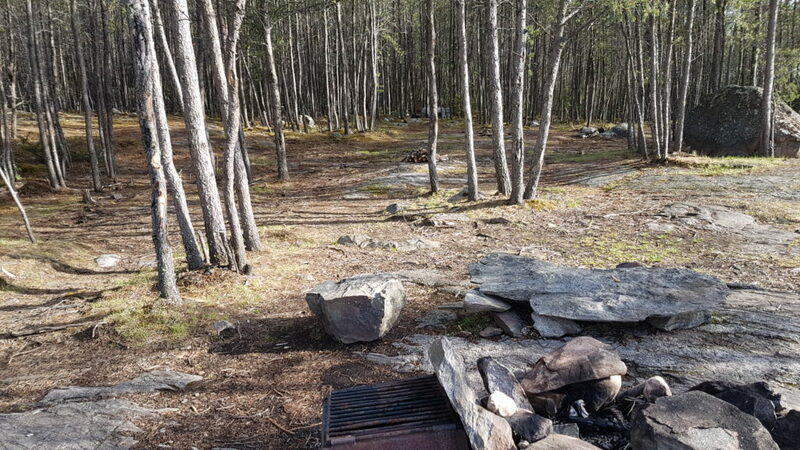 Everything looked perfect, we had a very nice little fire pit along with an enclosed little grill. There was plenty of space to set up all 3 of our tents, so we picked out our spots and got everything set up nice and quickly. 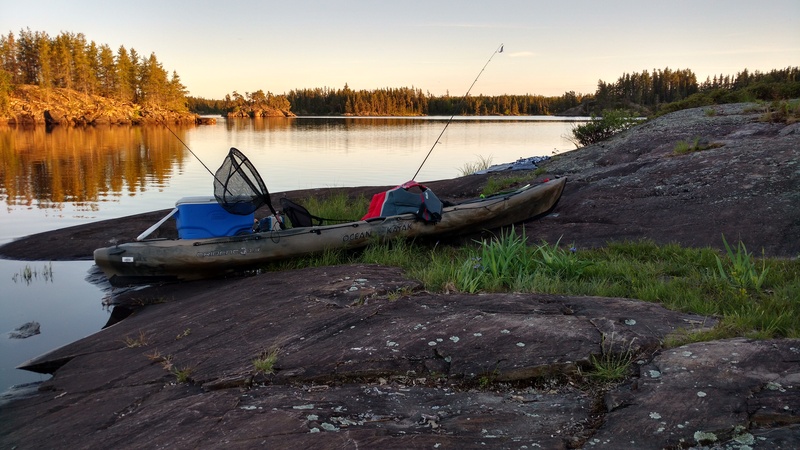 It had taken us about 8 hours from the launch to the campsite, and no one had a lot of energy left to go out and do any more paddling, so while I got dinner started everyone else settled in for some shore fishing. 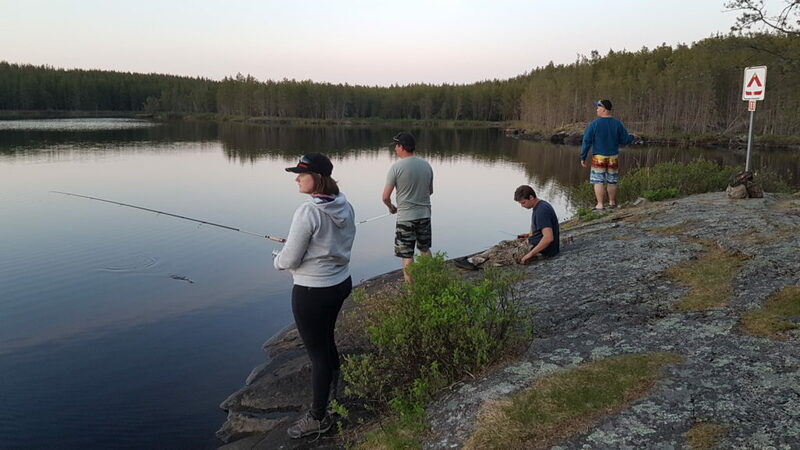 Fishing on shore was pretty great in the evening, we got plenty of smaller sized walleye the first night, even Les! After a good night’s sleep, we woke up on Wednesday morning ready to rock. 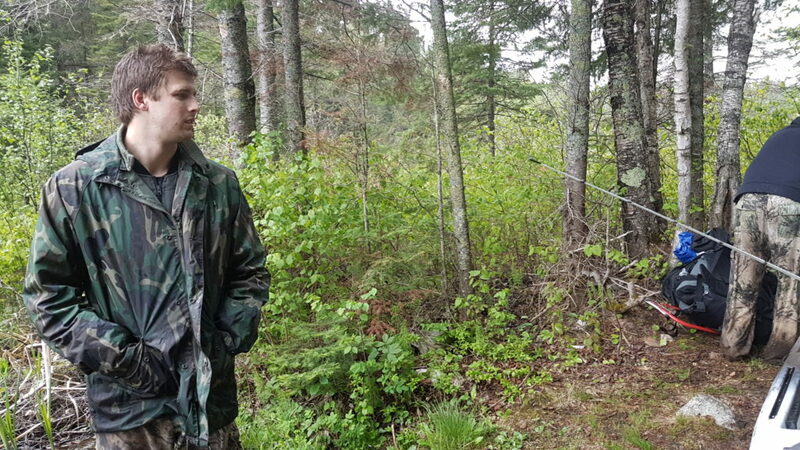 Before I had even crawled out of my tent Colin had already reeled in a nice big northern pike. 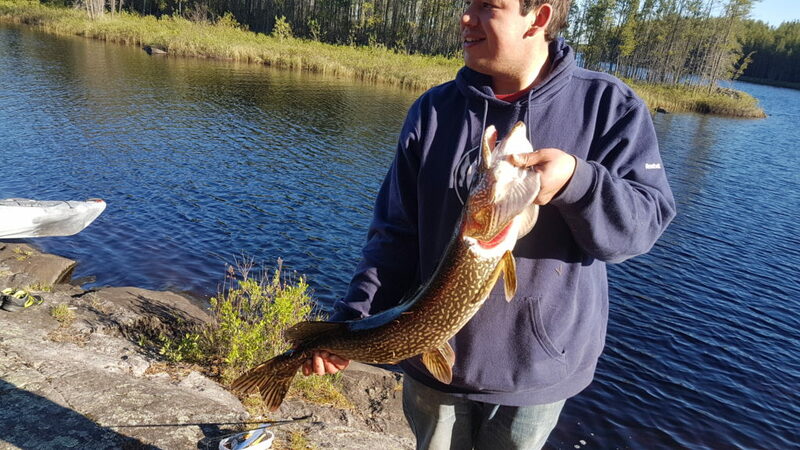 It measured in at 37 inches and had some beautiful patterning. We took this as a good sign for the day. 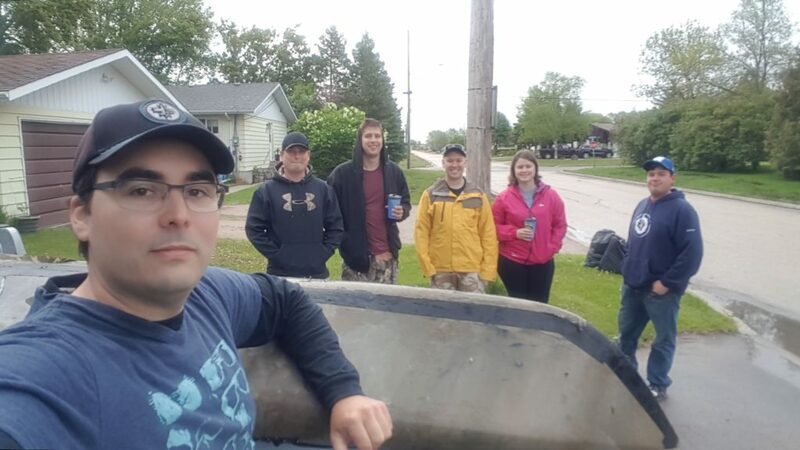 After a very hearty breakfast, we headed out for a full day of fishing with the plan of having a fish fry for dinner. We all spread out and covered different areas of the lake, I ended up sticking pretty close to camp and covering a large shallow bay. 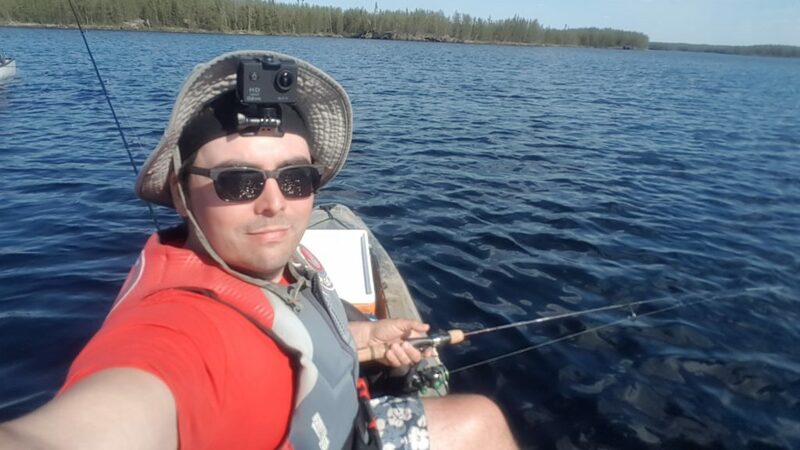 I was hoping to nab some pike or bass for our groups fishing challenge but despite trying a whole variety of lures I couldn’t get a single bite. 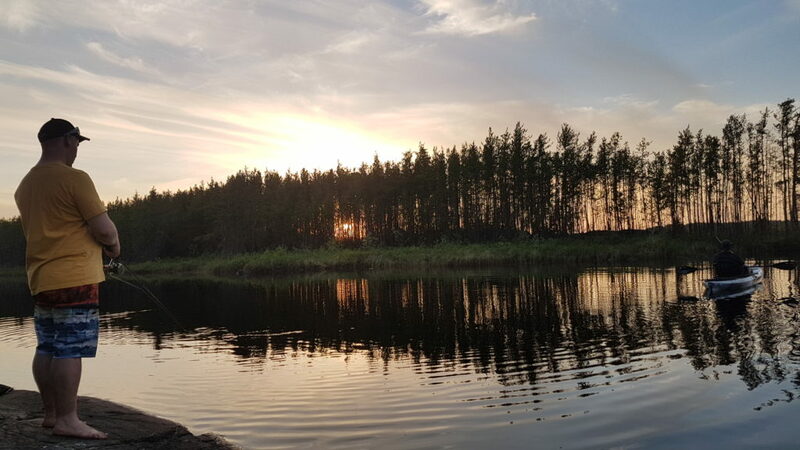 I worked my way around the big island we had camped on, fishing different areas along the shore as I went. 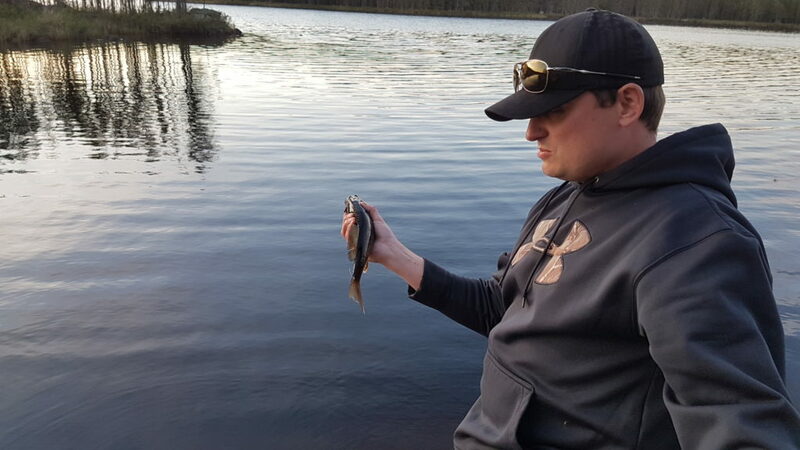 I didn’t catch anything for most of the day, and was starting to get pretty frustrated. 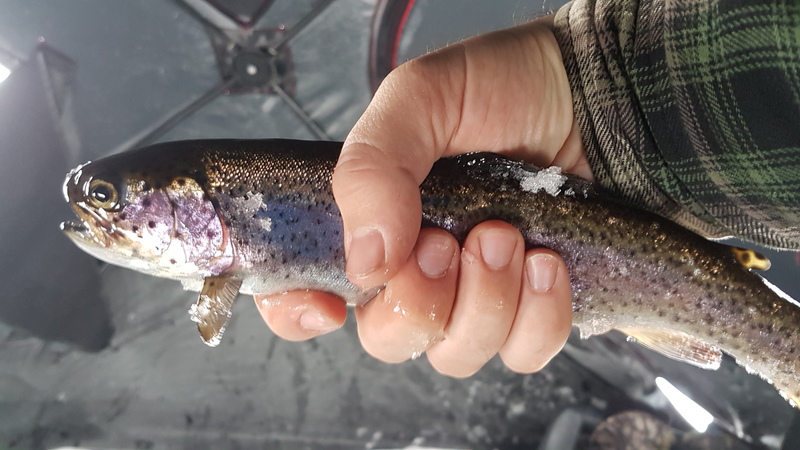 I had been told by a number of people that the walleye in this lake were plentiful, and would bite on anything, but so far I had nothing to show for the day. Where all the fish at?? 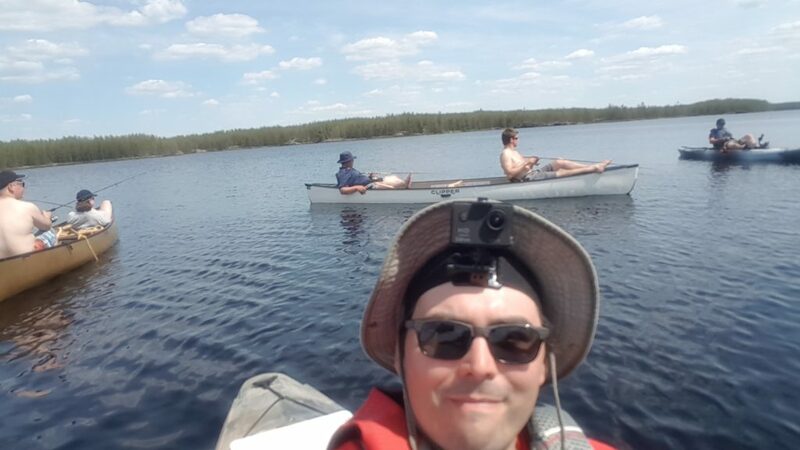 As luck would have it, I met up with Gary and Colin in their canoe on the far side of the island. They had gotten their anchor wedged and ended up having to cut the rope. 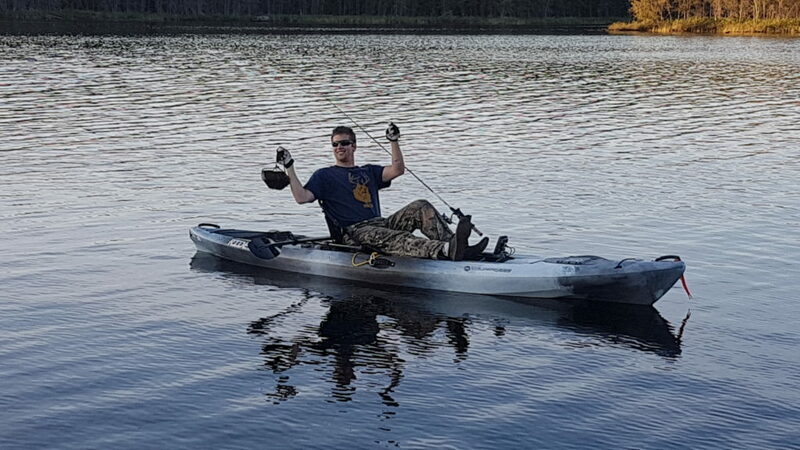 So with no way to keep themselves still, we anchored my kayak and they tied on to me. This was difficult as there was a strong wind and current and my anchor was having trouble holding the two boats in one place. We drifted out over a spot that was about 13 feet deep before my anchor caught and held us. 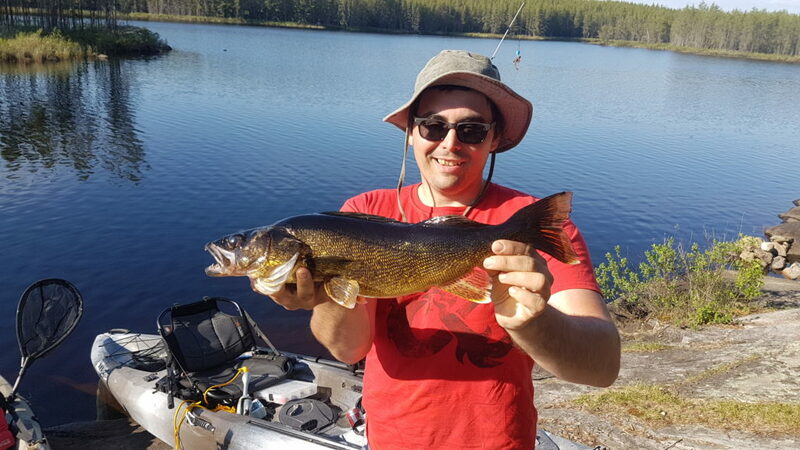 That depth turned out to be the exact perfect spot, and we started to pull in walleye pretty quickly. The day was pretty much over though, so we got our bearings to find the spot again, raised anchor, and paddled back to camp. 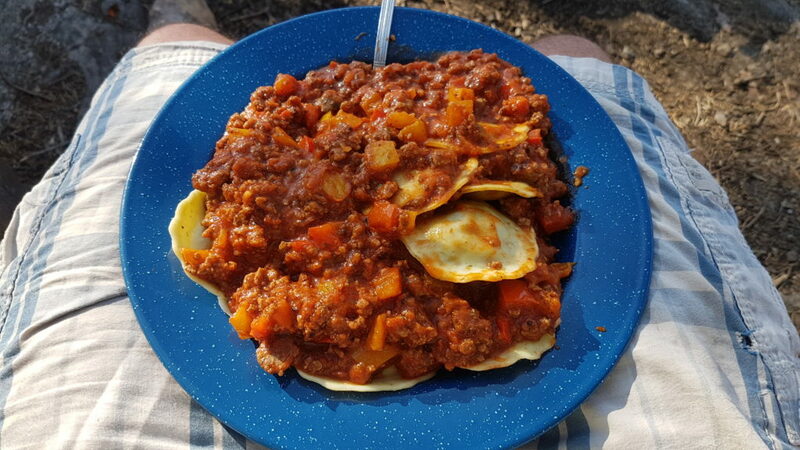 Dinner was not the big fish fry we were hoping, but still, you cant go wrong with a hearty meat sauce over spinach and cheese ravioli. 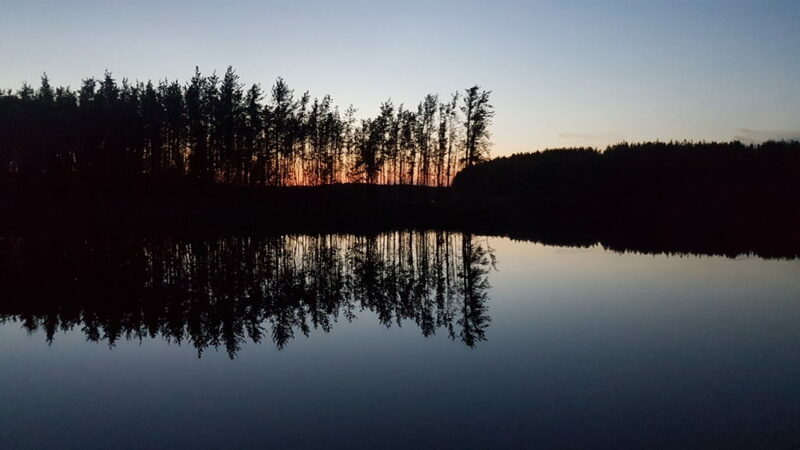 Another comfortable evening of catching fish off shore, enjoying a campfire, and getting a nice peaceful sleep. Thursday found us cooking another hearty breakfast and heading out once more onto the lake for another full day of fishing. Our target this time was clear, we headed back to the only spot we had found the walleye the evening prior, found that magical 13 foot depth, and started jigging. Sitting in that spot, the action was non stop. 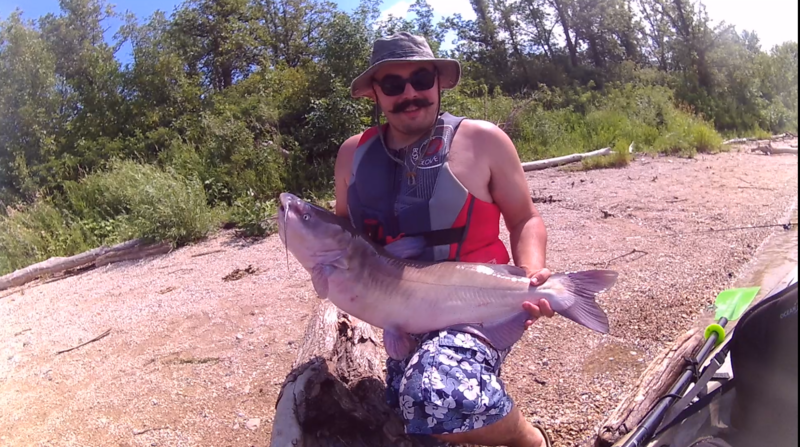 I pulled in fish after fish, oftentimes with my jig not even hitting bottom before another fish was on it. 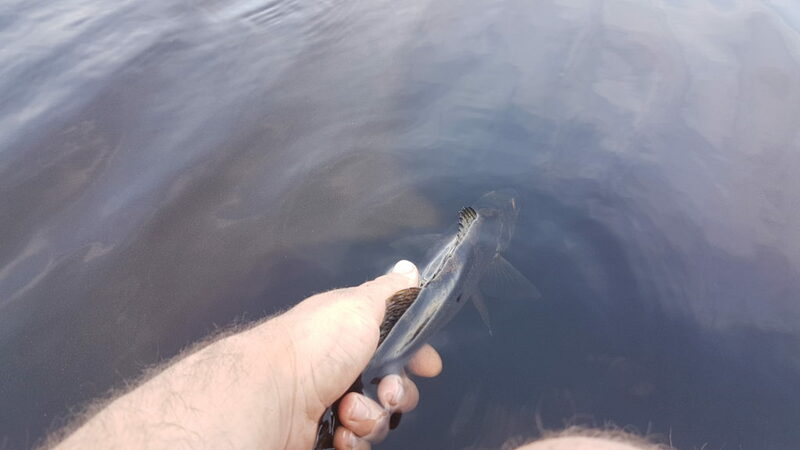 For fun, I even dropped in a bare jig with no bait just to see what would happen. Sure enough, I pulled in 6 walleye in a row doing this. We really couldn’t have asked for better fishing, and we spent a solid 5 hours anchored in the same spot. Obviously, we had plenty of fish for dinner, and back at camp we had a huge fish fry. It really doesn’t get much fresher, or more delicious than taking your walleye straight from the stringer and into the fryer. Everyone was stuffed and content. 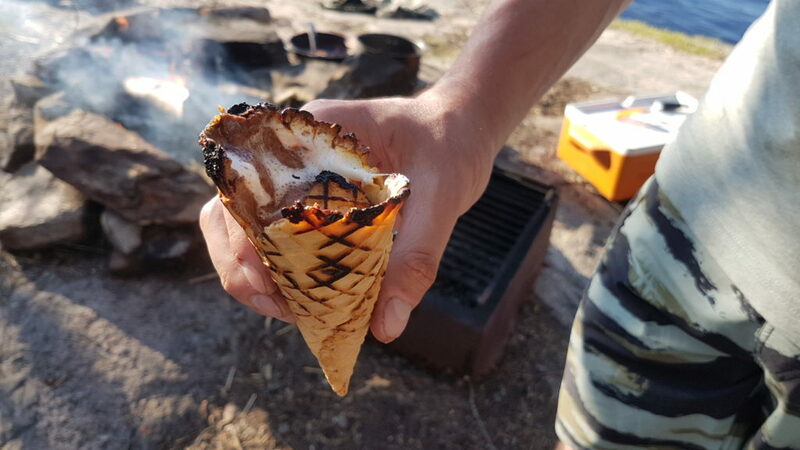 Dessert was just as good, we did a twist on the classic s’more and used waffle cones stuffed with marshmallows and chocolate, which we then wrapped in foil and roasted them in the campfire. The result was delicious. One last evening of fishing off shore, and catching more nice fish, and we settled in for our last night at camp. Another early morning and huge breakfast on Friday, as we packed up and left camp to start the trip back home. 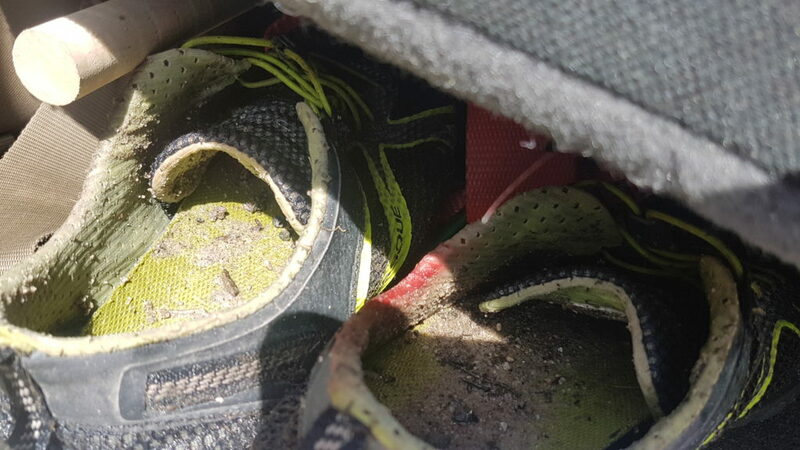 After 4 days, we were all looking forward to a hot shower and our own beds. We had great weather on the way out, the sun was shining and the sky was clear. We made much better time getting through the portages, due to all our coolers now being empty. 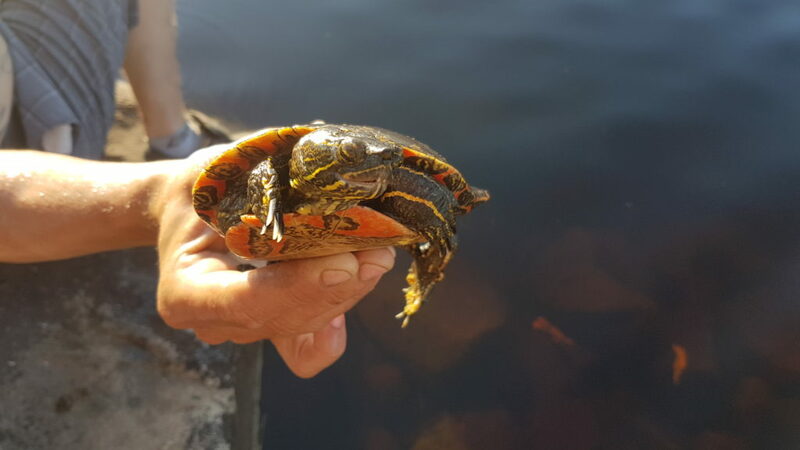 I found some more gold, everyone had a nice relaxing paddle and enjoyed the sun. We got back to the boat launch in roughly 5 hours, and had the trucks loaded up in short order. Most of us got at least a little bit of sunburn, my legs and ankles took a beating walking through the rocks and rapids, we were all sore, and tired, but everyone had a fantastic time and agreed that we should do it again. 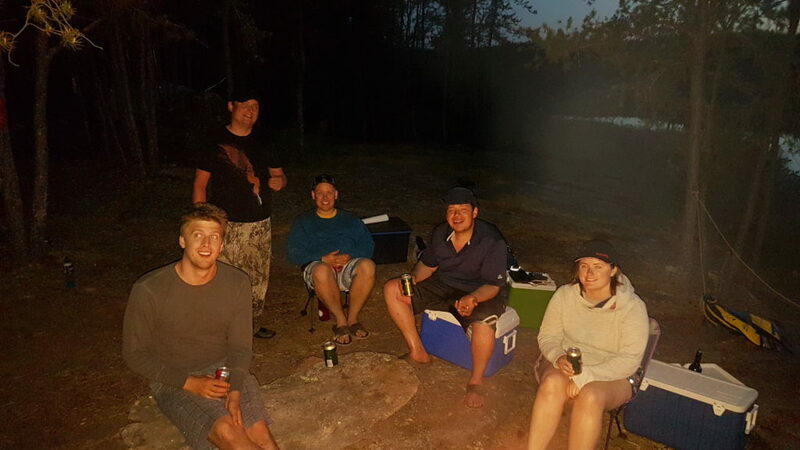 This was one of my most successful camping trips to date, everything just worked out perfectly. 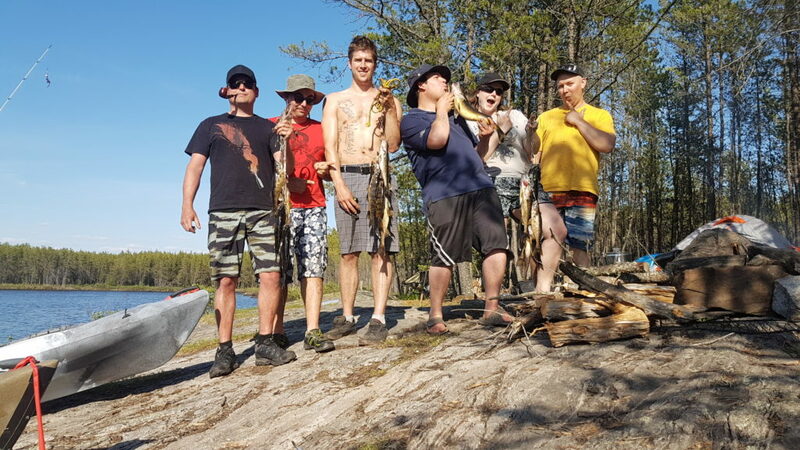 We didn’t forget to bring anything, we had the exact right amount of supplies, we had great fishing, great weather, and we didn’t get sick of each other after 4 days. There really is nothing more we could have asked for. 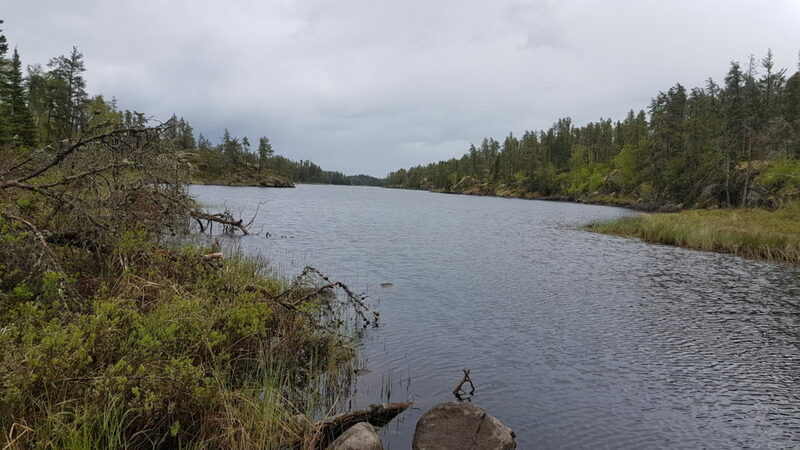 The route was scenic, the lake was beautiful, and we all appreciated that we are lucky to be able to enjoy such a great wilderness area that many other people will never experience.